John Sinclair: "People who were around then will remember the magic MC5 shows at the Grande that were starting to evolve out of that whole context; every time the band played there it was a mystical experience unlike anything in the history of music. They blew other bands away completely! I remember when The Beacon Street Union came into town riding high on the 'Boston Sound' hype, the 5 DESTROYED them - so bad that it was embarassing! 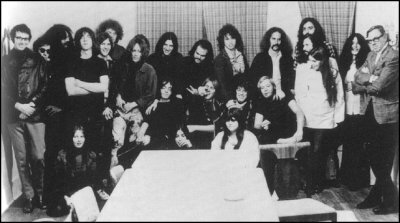 The news of that encounter spread across the country, and when the first tour of Blood Sweat & Tears was due to visit Detroit, Gibb was instructed by Columbia Records, that the MC5, who were scheduled as support band, were to be taken off the bill. So the Stooges took our place, and they DESTROYED Blood Sweat & Tears! Release of LOOKING AT YOU / BORDERLINE 7"
Now, their set list includes song "Kick Out The Jams"
Wayne Kramer: "Tyner and I used to write at the kitchen table, with a little amplifier, and smoke a lot of marijuana. I would just play guitar and he would say, “Wait! That there. Play that again.” One day we were coming up with some new tunes, and we said, “Let's use [the phrase] ‘kick out the jams’ [in a song].” He went off to the bedroom and came back in a minute and said “I got it. I got it!” I’ve only found out through reading interviews with Rob that he was actually talking to the rest of us in the band in that song – “Let me be who I am.” I mean, Rob Tyner didn’t want to be in a rock ‘n’ roll band. He said, “No, man, I want to play jazz. Rock’s for squares. That’s kiddy stuff. Listen to [Charles] Mingus.” It wasn't until he heard the Rolling Stones that he said, “Whoa, this changes everything.” "
Mike Mitch : "I first saw the MC5 at the Shadowland Ballroom in Benton Harbor Michigan. About 1968 I think. There was a buzz going around that "the coolest band in the world was coming to BH" and they were from Michigan. There was also a rumour the Police were gonna bust the five! Sure enough the night of the concert Shadowland is crawling with cops (or pigs as we called them then). If the five said "Motherfuckers" in the intro to Kick out the Jams they were busted. So brother J.C.Crawford came out did his rap and intro and the five get ready.."and now it's time to"......Rob steps to the mic and there is dead silence.."KICK OUT THE JAMS.".. he looks around the police tense and he shouts B E N T O N H A R B O R ! The pigs are totally deflated we are assauled by a wall of music and I experianced the best rock n' roll show ever! They did all the hits plus James Brown's Papa's Got a Brand New Bag with John Sinclair on saxophone. I was in the second row behind a little girl in a wheelchair. Rob Tyner played up to her during I Want You Right Now. When he crawled to the edge of the stage near her she peed her pants. After the show we tried to go back stage but the cops said "nobody was getting back there with those animals." I think they honestly believed the MC5 would corrupt us if we got close to them. What they didn't realize is they were too late!We had just been changed forever by the best rock n roll band in the whole world." Ken Kelley: "I'll never forget the first time i saw the MC5 perform that hot June night in 1968 at the Grande Ballroom ... The ozone scent of anticipation quickened my pulse as Rob Tyner jumped to center stage and shouted 'Kick out the jams, motherfuckers !,' the opening rant into The 5's anthemic underground hit song. As Tyner squirmed and sang, behind him were two sparkle-sequined guitarists who traded-off lead in a fervid fusillade of fiery notes and converged the role of rhythm into flesh-tingling licks of backup vibration: Wayne Kramer on Fender guitar and Fred Smith on Mosrite guitar was how the band described the arrangement. "High-energy ! ", in the vernacular tribute of the times. When Fred played solo on his trademark-tune, 'Rocket Reducer No.62', you knew why he got his name 'Sonic' - the only word that packed enough 'G-force.' Solo, his raven-black pupils vanished under hooded lids, his spine stiffened like a bolt, snug-tight in pink satin pants, his pink-sequined jacket draped his torso behind the gleaming-white instrument he'd back-and-forth stab into the outer space above his head. He leaped up and down, lurching in freaky Frankensteinian jolt-steps while simultaneously spinning around the stage in swirling orgiastic gyrations of musical frenzy, like some demonic pogo stick in the eye of a tornado funnel. Bob Rudnick and Dennis Frawley, columnists for the EVO, go out to East Orange to do a nightly show on WFMU. 7 Wednesday / Publication of an article in the Ann Arbor Sun announcing the Festival Of Life on Sunday 25 of August in *Lincoln Park*, Chicago. Charles E Reisen excerpt from his novel "Playing Guts Ball" (fiction) : "Carl got up the next morning and went down to Lincoln Park with Joey and Clark. It was a different kind of demonstration, more like a big lawn party for hippies. There weren't many straights; no suburban mommy peace groups around, but it was a friendly crowd. The Chicago Outlaws motorcycle club was there, colors sewn on their leather jackets, and jeans with rawhide lacing, and the Detroit band MC 5 sang and strutted through "Kick Out the Jams, Motherfuckers." Carl got handed a wad of "psychedelic burlesque" Yippie money, with Jimi Hendrix in the president's oval, and the mottoes "strip for peace, in LBJ we trust none, only love is legal tender and private". Nobody had come around with a bullhorn ordering them to disperse, no warning at all, when Carl noticed the cops massing downfield from the crowd. They charged in a broad front; first Carl was rooted, disbelieving, as huge, snarling cops, shaking their Billy clubs, bore down on him, while his knees turned to jelly. When they came within twenty feet, his schoolyard instincts kicked in, and he ran like hell from the bullies until he could turn around safely. The cops clubbed and chased everybody, hippies, bikers, and musicians, trying to clear the place, but Lincoln Park was big, with room to retreat and regroup. After a while, the cops seemed to be satisfied with just breaking up the big lawn party. Later, they would return to enforce the 11 o'clock curfew in the park. The Yippies had gathered again and were preparing to spend the night; the cops chased them out and through the streets of Old Town. Danny Fields: "John Sinclair was a friend of friends of mine, and they put me on their mailing list for all their marvelous graphic propaganda ... My friends persuaded me to go out to Detroit and have a look at MC5 ... I stayed in Sinclair's house, in the commune, i loved the whole situation, the Minister of Defense with the rifle in the dining room, the men pounding on the table for food like cavemen, and all trhe women running in and out of the kitchen with long Mother Earth skirts on and no bras. In the middle of Ann Arbor, this totally middle-class college town. The men did everything but drag them by the hair. Who ever saw anything like it in New York? 26 Thursday / Signature of the long-term contract Elektra/MC-5 in New York. Jac Holzman: "Danny had immaculate taste for the arcane and he knew i'd go for it ... but i was intrigued by how the MC5 maneuvered their music to drive their politics, like a loudspeaker assault on the established order : Who is on the inside, who is on the ramparts? - a rock and roll equivalent of storming the battlements. Fields quickly flew Landau out to Detroit to see the band. 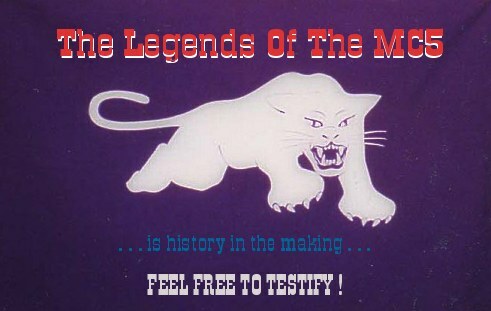 Landau, who had never heard of the White Panthers or Sinclair, found them intimidating. "I never met anybody like Sinclair," he recalled. "When you shake hands with John Sinclair, you're shaking hands with somebody. He just had a presence." Visiting the White Panther headquarters on Hill Street in Ann Arbor was even more uncomfortable. "These people were just too far out," he said. Mike Mitch : "The Hulabaloo. We all thought it was a lame club. It had these stupid pink cutouts of a boy and girl go-go dancers on the wall behind the stage. There were also big pink cut out letters spelling out HULABALOO on the wall behind the stage. On the night the MC5 played it was really hot and they had the side door by the stage open. By the time we got there they were already into there set and we were pretty high. Now this place wasn't very big and the ceiling wasn't very high. If you were on stage you could reach up grab the stage lights. Given all that it was hotter than hell inside and twice as loud. We loved it! I don't recall what set Fred Smith off but he took his guitar and hit a stage light. I think the management said something and then all hell broke loose! the band was crankin' out "... ramalama fa fa fa" when Fred and Wayne started bashing the lights and Rob Tyner pulled the go-go girl off the wall. The crowd was a mixture of freaks and dorky straight girls who probably thought the MOTOR CITY FIVE played smooth motown music. They started screaming and we urged the Five on to greater excess and then someone pulled the plug on the band and the house lights when on. All the kids were chased out of the club and the five went out the back door. Later we went back in and the place looked demolished. I often thought maybe the owners did some of their own destruction for insurance purposes. There were holes in the ceiling and broken glass and light cells all over the floor. The stage lights were in shambles and the go go dancers and some of the hulabaloo letters were ripped off the wall. I don't think they ever hired another Detroit band. The whole experience was like living inside of a song like "Kick Out The Jams". It was over fast really loud and hard to believe we were there." Altough the band members were on friendly terms with local underground journalists, they were suspicious of Rolling Stone, which they viewed as being "soft" on politics. My first night was spent answering their questions. They chided me about being a square from a conservative school in Ohio and asked me why i lived in a frat house instead of a commune and why i liked bourbon more than pot. As an acid test, several of them tried to toke me under the table with marijuana, and filled my head with horror stories about their scrapes with the narcs in the Detroit underground. Passing the test meant passing the pipe ... When Wayne Kramer and Brother J.C. Crawford started smiling at me and calling me "scribe," i figured i had passed the test." Bruce Botnick: "Jac felt that the only way to capture the MC5 was to record them live. I brought Wally Heider to Detroit from LA, the big matcher of remote recording. He flew the equipment in and we rented a truck, into which we loaded a portable console and dual eight-track recorders. The day of the concert i went inside, i was hooking up my microphones, and i walked out and i see Wally and Jac standing there. They're both staring at the ground. And laying on its back is one of the eight-tracks. They had put it up on the truck and the truck was at a slight angle, and it rolled off and fell six feet to the concrete. We went, "Oh my God, are we going to be able to record?" We picked it up, turned it on, and it was fine. Bruce Botnick: "And i'm this twenty-three-years-old kid, married only weeks before, wearing a blue Sixties long suede jacket, black leather pants ... and, i mean, these guys are very funky. They're looking at us suspiciously, they've got guns and a printing press down in the basement printing revolutionary literature, and there's this kid looking very rich. I was scared shitless. I remember calling my wife and i was so nervous i started to cry over the phone. We finished and i said to Jac, "Let's go home." He was feeling it too. He got on the phone, he arranged for the flight. And we bundled up the tapes and grabbed a cab. Wayne Kramer: "That was Elektra’s idea in the beginning, which we endorsed. We thought it would be kind of a revolutionary act for a band’s first record to be live when conventional wisdom was that about the third album was live. You do two or three studio records to get yourself established at radio and then you could do a cheap live album and score big. Of course, after years of watching the record business, I can look back and say the reason they did it live was because it was cheap. They came out of there with an album for under $10,000." 18 Wednesday / "The scene at the Fillmore was nothing like the high-energy rock'n'roll celebrations the MC5 were used to back home. The Wednesday free nights had degenerated into little more than a warm place for street people to conduct their business. Drugs were being dealt, people were being shaken down for money, and gang rivalries were being played out in the aisles. The mood was already tense, and the 5's habitual lateness didn't help. When they finally arrived, the stage was littered with agitated street people, some mumbling ominously about "rock stars keeping us waiting". Feel free to get in touch with us if you have any additions to this!